Catlin Art Prize winner + Bauhaus Professor of Experimental Television. KillaVolts present an eclectic and electric fusion of Future Bass, Minimal, Folktronica and Dub, performed live using a combination of synths, laptops, midi controllers and traditional instruments. Reynir Hutber and Ben Sassen began performing together almost 10 years ago as part of Iconscious Collective – a group involved in online radio and video broadcasts before the YouTube phenomenon. Early A/V gigs took place at The 291 Gallery and Big Chill Festival. Subsequently, in 2006, they formed KillaVolts and toured internationally. Dates have included Audio Visiva (Italy), The Rocket Festival (Spain), Electro Shock (Germany) and Glade, Bloc and Sunrise (UK). Reynir is a video and performance artist and the most recent winner of the Catlin Art Prize. Ben is currently Junior Professor of Experimental Television at The Bauhaus University in Weimar, Germany. 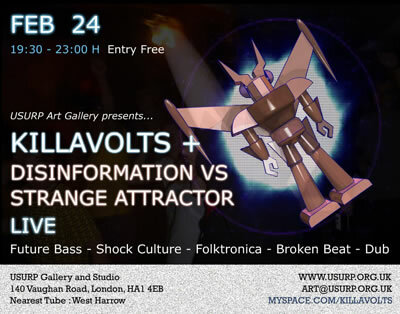 Disinformation and Strange Attractor present Circuit Blasting – a live performance using 35kV discharges to electrocute electronic keyboards (and, if you ask nicely, to electrocute members of the audience). Described as “a bit like Circuit Bending, but alot less subtle”, the Circuit Blasting CD recorded by Strange Attractor and Disinformation is released by ADAADAT Records. Joe Banks (Disinformation) is an installation artist and AHRC sponsored Research Fellow at The University of Westminster. Mark Pilkington is the founder of Strange Attractor Journal and author of the new book “Mirage Men”. Both performances take place alongside “The Origin of Painting” and “Rorschach Audio” installations, currently exhibited at Usurp by Disinformation.